In his apartment, Bailey Anderson apologized for the mess. At the moment, he was still trying to organize his collection of 8-inch heels, Pamela Anderson-style wigs and bloody prosthetic bald caps. “Your blood spilled inside your bag,” his roommate said to him at one point. In November of 2017, Bailey created his drag persona Trisha Delish, who he describes as “a slutty housewife who is going through a midlife crisis, and [is] trying everything out and figuring out what she wants to do and who she wants to be.” Bailey brings Trisha to life with pin-up outfits and housewife dresses while also incorporating comedy into his performances. Bailey incorporates elements of horror into his character, using his experience from working at a haunted house for three seasons. “I realized that I like the versatility of switching from this sultry housewife to like, my eyeball falling out or my head being cut off,” Bailey said. Trisha Delish poses in front of a piano in her apartment. She was the season one winner of The Queer Off, a 14-week live competition at Sue Ellen’s in Dallas. Image by: Jacob Ostermann. Both the sultry, comedic performances and the gory getups require their fair share of costumes and accessories, and Bailey ensures that each of his pieces are unique by designing and altering them himself. In January of 2018, he started Delish’s Custom, a costume company offering outfits, accessories, latex pieces and prosthetics. While his friend and previous haunted house coworker makes the company’s wigs, Bailey creates all the costumes himself. Bailey said he learned how to sew at a young age and competed in his high school theater department’s costume contests. Since starting Delish’s Custom, Bailey has used platforms like YouTube to continue learning. Kylee O’Hara Fatale, drag queen and producer of The Queer Off, a competition show in Dallas, said she met Bailey while performing at a bar in Denton. Now, Bailey and Kylee are as close as sisters and Bailey has designed several costumes for her. “[Bailey] came out to the show every week when she turned 18 and loved it and loved us,” Kylee said. Jay Anderson, Bailey’s father, said that he was somewhat familiar with drag after watching “RuPaul’s Drag Race.” He said Bailey’s costume-making helps Trisha stand out during drag performances. Bailey said balancing drag and costume designing with college life is not easy. Virtually all of his free time is dedicated to making costumes and performing at or attending shows. Drag also consumes much of Bailey’s financial budget. Without a job outside of Delish’s Custom, he uses much of his National Merit Scholar refund money and everything he makes from performances to invest in his business. He estimates that he has spent around $15,000 on Delish’s Custom. “It’s really hard to convince myself not to make drag my priority when it is what I’m going to be doing for the rest of my life and I don’t need a degree for it,” Bailey said. 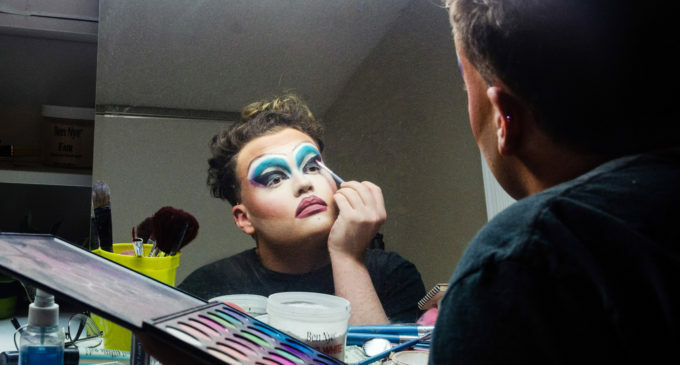 Being a drag queen in Denton is becoming more and more challenging, Bailey said. Dallas, however, is a buzzing hub for gay bars and drag shows. Bailey said the environment is “fiercely competitive” and a lot of queens from “RuPaul’s Drag Race” have started there. Recently, Bailey won one of Dallas’ own competition shows. The Queer Off is a 12-week live competition at Sue Ellen’s in Dallas, produced by fellow drag queen Kylee. She encouraged Bailey to participate in the first season of the competition, which premiered Aug. 1, 2018. Trisha finishes taping her wig cap before putting on her wig. She designs her own costumes, prosthetics and accessories through Delish Customs. Image by Jacob Ostermann. Winning The Queer Off has helped Trisha Delish gain exposure. Trisha returned as a judge and special guest performer for The Queer Off’s second season, which started Jan. 30. Bailey said he sees Trisha as an extension of himself, and figuring out who she is has helped Bailey find himself. Kylee said drag has made Bailey more confident and outspoken. Bailey sees himself performing as Trisha and designing costumes for the rest of his life. He intends to apply to a fashion design school in Los Angeles for the summer and eventually get a brick-and-mortar facility for Delish’s Custom. For now, Bailey is determined to continue developing Trisha’s persona and improving his performances. Featured Image: Trisha applies eye makeup while she gets ready. She is now a judge for season two of The Queer Off. Image by: Jacob Ostermann.